"Steve Shinn provided a complete remodeling of our kitchen, patio, pool, and backyard, including all landscaping. The work was done in two stages, first the kitchen and then the rest. All of the work done through Homework Remodels was excellent. We and Steve can be proud of it." We’re ready to earn your 5-star review! There’s a reason we get so many five-star reviews. Our value is most appreciated by homeowners like you with nagging challenges with their home that they need creative help to overcome. Many of our clients have remodeled with us multiple times and see us as their trusted advisor. They own unique homes and value high-quality design, materials, and construction. Our first-time clients share the following challenges that we helped them overcome. See if one or more of them may fit your situation. Because they are busy professionals, they can’t take the time to plan and supervise things themselves and know they need professional help and results. They prefer to have one point of contact to eliminate their following concerns. Does something about your home have you feeling like we are describing your situation? If so, what could it hurt to call us to question us about how we can help you? 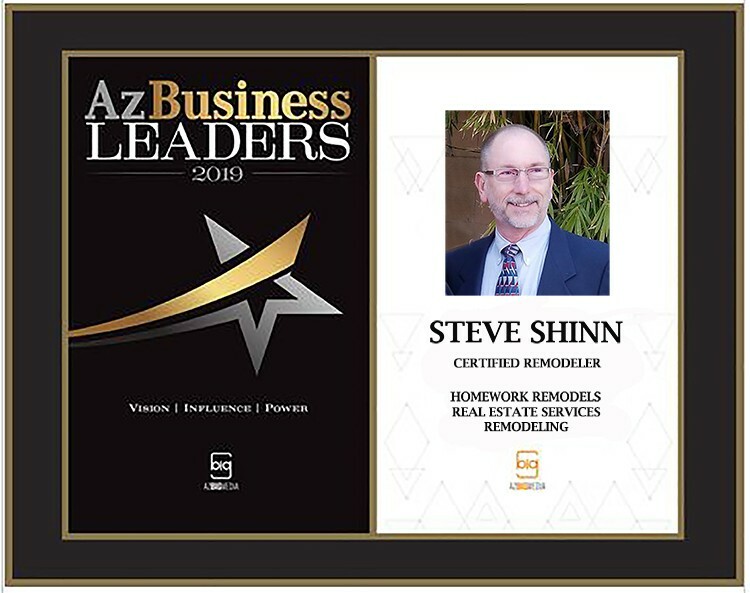 Steve Shinn leads the talented group of design and construction professionals at Homework Remodels doing home remodels across metro Phoenix.